Ten Thousand Skies Above You | Howdy YAL! Posted in Review, Uncategorized	by Howdy YAL! Ever since she used the Firebird, her parents’ invention, to cross into alternate dimensions, Marguerite has caught the attention of enemies who will do anything to force her into helping them dominate the multiverse—even hurting the people she loves. She resists until her boyfriend, Paul, is attacked and his consciousness scattered across multiple dimensions. Marguerite has no choice but to search for each splinter of Paul’s soul. The hunt sends her racing through a war-torn San Francisco, the criminal underworld of New York City, and a glittering Paris where another Marguerite hides a shocking secret. Each world brings Marguerite one step closer to rescuing Paul. But with each trial she faces, she begins to question the destiny she thought they shared. 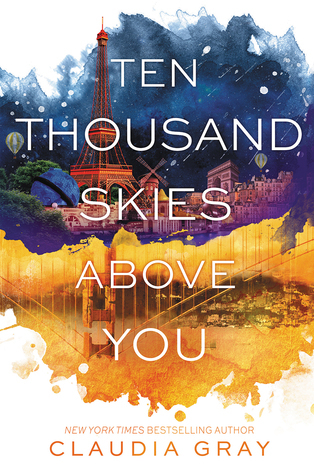 The second book in the Firebird trilogy, Ten Thousand Skies Above Youfeatures Claudia Gray’s lush, romantic language and smart, exciting action, and will have readers clamoring for the next book. A Thousand Pieces of You was one of my favorite guilty pleasure reads of 2014. It’s sequel is just as good if not better. While there are still visible faults, there was definite improvements in the second installment of this series. Which actually sort of surprised me because usually in series-especially trilogies-the middle book is usually the weakest of the bunch. Here though, great development is made with the characters and the plot. I’m still not 100% sold with Paul and Marguerite, but I have a better understanding for the couple and can appreciate them. And I have to praise and get annoyed at Gray for giving an awesome tease of what a relationship with Theo and Marguerite could’ve been-note to blog reader, I get bored with straight men (which is what Paul is) Theo is more my style. The alternate dimensions for the most part weren’t as interesting as the previous installment, but there were some interesting aspects about some of them. I also liked the fact that we did get to revisit one particular dimension (for spoiler purposes I won’t go into particulars here). Like with the previous installment, there is a clear plot, but like with the previous installment not everything is what it seems. There are so many ways that this book could’ve gone, and certain twists and turns surprised me. At the same time though, there were a lot of suprises. While there was a lot of development with the main cast, and some development on the motives behind the Triad. I did think, for the most part, the villains in this book were still relatively flat. Which is sad. They really just make an appearance whenever it’s to escalate the plot. Not so much with the main characters who are well formed . I get that it’s in Marguerite’s point of view and of course it’s going to be limited to her thoughts, but I wish there would’ve been a little bit more interaction with the villains. I am hopeful that that will be happening in the next book, but I really think there should’ve been more before the third book. I know it sounds like I’m nitpicking a lot about this book, but truth was I really enjoyed it. It was fast paced, fun, and different. Yes, I know, there are a lot of YA AU dimension books out there, but I really like the spin that Gray takes on it. There’s always something so romantic about her books. Yes, the romance can borderline on cheese and doesn’t always work-I was never a huge fan of her vampire series and I sort of gave up on her witch series as well-but when it does it’s really wow inducing. And I think the Firebird series is where this quality shines. You have two people who find each other in all these different worlds and it’s really interesting seeing how they interact with each other if circumstances were different. Romance in a Claudia Gray book. Over the top, a little bit cheesy, but oh so good. I am eagerly awaiting the next installment to this series. It’s not perfect, but it is a fun read and has a lot to offer. Overall Rating: I’m feeling generous so A- (it really should be a B+). The villains are a little weak, but I think that’s going to be resolved in the next one. But overall what a fun read.